By John J. Raspanti, DoghouseBoxing.com. 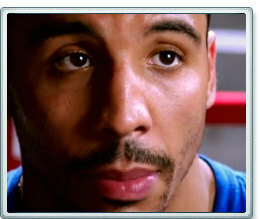 In his seven years as a professional fighter Andre Ward (26-0, 14 KOs) has heard many descriptions of his boxing style. ‘He gets the job done,’ they’d say or, ‘he wins ugly.’ On Saturday night in Oakland, Calif., Ward did more then just get the job done. The WBC and WBA super middleweight champion impressively stopped light heavyweight champion Chad Dawson in the tenth round at a rocking Oracle Arena. Ward worked the body exclusively in round one. Dawson stalked but was unable to find Ward. A counter right in round two connected on Ward’s chin. Ward landed a solid left. Dawson worked more behind his jab and landed. In round three Ward came out jabbing. The length of Dawson was a problem. Ward found Dawson’s body with a right. A Ward left hook knocked Dawson down for a three count. Dawson got up with a shocked look on his face. In an explosive fourth round, Ward knocked Dawson again with a sharp left hook to the head. The light heavyweight champion was obviously hurt. Ward’s sharp jab had turned the tide of the fight. Dawson’s legs still looked rubbery. Ward tried to finish the fight once and for all. Dawson stuck out his jab and tried to survive. Ward staggered Dawson but couldn’t follow up at the bell. Ward kept utilizing his sharp jab in round five. Dawson countered with hard left to Ward’s chin. Ward landed two flush left hands on Dawson’s chin. His left hook was paying dividends. In round six Ward stalked a backpedaling Dawson. Dawson found Ward’s chin with a long left that had no effect. Round seven saw Ward contine to box and pounce. He would jab his way in and throw a combination and get out. Dawson had no answer. Ward landed two jolting rights. Dawson was able to connect with a sharp left. Ward was still jabbing effectively. In round eight, Ward went back to the body of Dawson. Ward landed two inside hooks. Dawson went for the home run and missed. Ward showed off his inside game by raking Dawson with two hooks near the ropes. Round nine started slowly but picked up steam. Dawson was now looking for the knockout. Ward was a step faster. Dawson was staggered again by a sharp left hand. Dawson wouldn’t quit thought. He landed a crisp combination that surprised Ward. Ward pushed Dawson into the ropes in Round 10. Both fighters looked a bit worn. Ward landed a combination - punctuated by a hook that knocked Dawson down for the third time in the bout. Dawson was hurt and exhausted. He got up at six but referee Steve Smoger had seen enough. “In this game you have to take risks,” said Ward who scored his first knocked victory in four years. “Chad Dawson is a monster,” added Ward.